Are successful businesses the result of luck or skill? Perhaps there is a little bit of both involved, but ultimately, success is the result of consistently making sound business choices. Making “the right choice” may feel daunting or even impossible, especially when you have so many factors to consider. Decision trees are one tool that will help you weigh your options and standardize decision-making processes for your entire company. But in order to share them effectively, you need to build and store them in an app that everyone uses— an app like Google Docs. In this article, learn how to make a tree diagram in Google Docs to enhance your reports and standardize best practices. The key is Lucidchart. Use a decision tree template in Lucidchart. From your Google Doc, select Add-ons > Get add-ons. Follow the instructions to complete setup. Don’t worry; it’s easy. Simplify the process by signing up for a free Lucidchart account. From your Google Doc, select Add-ons > Lucidchart Diagrams > Insert Diagram. Find your diagram in the documents list. If you need to make changes to your document, simply update it in Lucidchart, and then follow these steps to insert your diagram again. As you are making a tree diagram to walk you through your next big decision, take a look at some of these resources. “How to Make a Decision Tree Diagram” will walk you through the step-by-step process of building a decision tree in Lucidchart. This tutorial includes steps for calculating the value of each possibility so that you can base your business decisions on data rather than intuition. “All About Decision Trees” explains the basics of decision trees and decision tree notation. Learn about the pros and cons of decision trees, as well as how they are used in various fields. 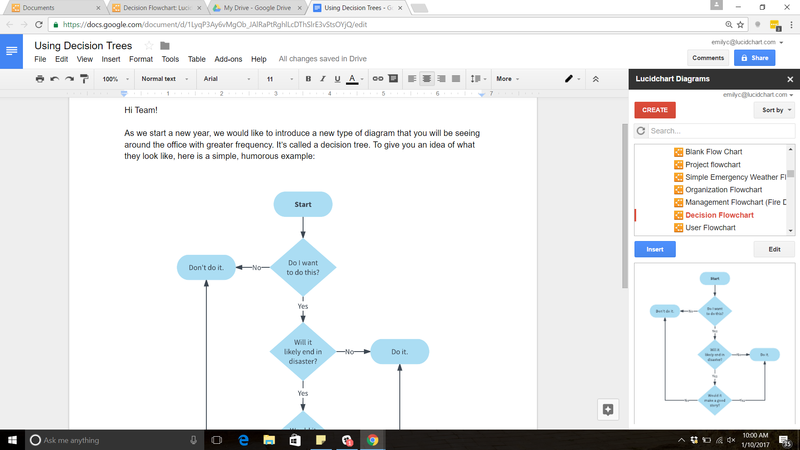 If you have any questions about how to make a tree diagram with Google Docs, leave it in the comments below.